The recent ant-war demonstration at Centennial square reignited the ongoing debate with my son about war toys. We covered the same territory as usual. In his view, there is a difference between pretend war and the real thing. In my view, the pretend toys make fun out of very real suffering, and encourage the idea that war is legitimate. It is something we have been debating for over a year and I must say, if anything positive has come from this seemingly endless argument it is a sense of respect for my five-year-old’s ability to work through complex problems. While other ongoing debates often begin to start to feel like prime examples of the “nag factor” advertisers strive to instil in our children, this debate surprises me by being less irritating. This despite the fact it was one of the issues I worried about confronting as a parent; I fretted about finding a balance between imparting progressive values and encouraging free thought. I imagined I might create a fascination with war-play by insisting it was off limits. In the end, however, I have myself become fascinated and engaged by the process of explaining my beliefs about war. I have come to realize, because of my son’s arguments, that my belief that war toys are wrong doesn’t completely square with my belief that children play with important ideas as a way of understanding them. And I am troubled by the idea that it is really his sense of the right to argue and debate that will lead him to the peace movement, not learning to obey my ideas. And indeed, it is my son’s fascination with Knights and “good and evil” that has provided me with the most salient opportunities to discuss the global issues I care about without exposing him to horrors of the “real world” I would like to protect him from. I felt proud to hear from teachers at his day care that when he was asked to label fairy tale characters “good” and “bad” he informed them that the wicked witch character was both good and bad because she had done both good and bad things during the story. As we listened to the Joshua Key describe in Southern U.S. twang his refusal to return to a second “tour of duty” in Iraq, his four children play with placards, and my son lay on my lap and occasionally responding to the use of the term Empire by those on stage with comments about Darth Vader. Music closes the event, and among the songs is a satirical peace movement favourite, in which the lords of business and the politicians march off to war instead of the usual young, black and poor recruits. “Oh, we hate to see them go, the gentlemen of distinction in the army!” My son perked up and I wonder briefly what he makes of the song, which could be taken literally as a pro-war song by someone too young for irony. Once the music is over he is worn out and ready for something that isn’t focussed on my politics (which he thoughtfully pronounced “boring”). We head to the credit union and then off to check out a board game I had promised to buy. Of course, once in the toy section he is immediately distracted by fierce looking Knights made of Lego, all sorts of cars and so action figures. Most parents I know are struggling with issues around toys–excessive consumerism and the predominance of militarism in play chief among the concerns. Sometimes this struggle emerges in amusing ways, and when I look along the toy shelf, I see someone had come to the board game section before me and hidden every version of “Risk” or similarly war-oriented game behind boxes of Scrabble and Boggle. I am still chuckling at this parental subterfuge when my son, who is digging through junky toys I know he would never play with for more than a day, pulls out a car set that absolutely stuns me. It features a truck that was being loaded up with glowing green rocks from a container featuring the nuclear hazard symbol–presumably radioactive waste. The set also features some green barrels, presumably for burying the waste. That was shocking and bizarre enough, but when I looked closer, I realise the truck was labelled “Easter Island” and features an image of one of Easter Island’s famous carved faces. The title of the set is “Nitrox Mine”. I stand in the toy aisle and think of French nuclear testing on Easter Island, and of a cargo nuclear waste sailing across the ocean to be dumped. And I think of the New Internationalist magazine I read the night before–a feature on “Nuclear’s Second Wind”, and the photo spread of nuclear themed toys that includes the chilling “Three Miles Island” play set. I tell my son “I can’t believe they would sell this!” and he recognizes the tone and moves on to likelier prospects. The other parents bustle about ignoring my outburst. I am seized by the impulse to buy this toy and mail it to the editors of New Internationalist. Instead, I snap a picture. Toys are in an arms race parallel to our own. The squirt guns are now ballistic shooters with long ranges. Kids with less powerful squirt guns lobby parents and grand parents for more expensive, more powerful squirters, lest they be too weak to play the game. And I am in a pint sized version of the struggle against the toy arms race. If I budge in my convictions, is it the end of my stand against the toy arms trade? Will I soon be overrun with pretend nuclear waste and miniature battles between plastic men? Will tensions escalate with neighbours as my thoughtless purchase drives their child to start nagging for their own plastic nuclear weapon? 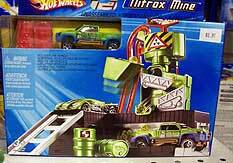 When we get home, I google the Nitrox Mine toy. The advertisement tells me that “this realistic playset allows kids to bring action to life with their Hot Wheels vehicles”. What child is imagining handling toxic nuclear waste on a tiny Pacific island? Perhaps the children are intended to bury the waste in the bathtub or front garden? That would be realistic. Even more so to bury it near the local Native reserve. 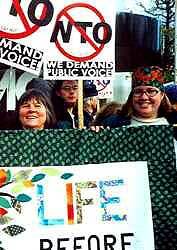 Stacy Chappel is a Victoria peace activist and mom. She is a director of BBCF.